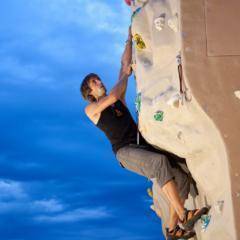 Climbing and bouldering are among the top sports at JUFA Sport Resorts. With the City Adventure Centre in Graz and the Climb & More Resort in the Styrian Fürstenfeld, two of the largest climbing halls in Austria are located directly at JUFA Hotels Sport Resorts! Directly at the city hotel JUFA Hotel Graz City*** the connected City Adventure Centre (CAC) is one of the largest climbing halls in Austria with almost 1,800m² of climbing area. The climbing areas are distributed between indoor and outdoor areas, with a ratio of indoor to outdoor distribution of about 5:1. At the installations and routes in the outdoor area, the lead climbing area 1 is on the ground floor, the lead climbing 2 on the first floor, and the lead climbing 3 area on the 2nd. Floor and boulder areas are differentiated. The Sky Walk is a special challenge, an adventure course at a height of twelve meters. The Fürstenfeld Climbing Hall is located directly at the JUFA Hotel Fürstenfeld – Sport Resort. A large part of the routes are difficulty ranges 5-7. The 8,000 grips were screwed onto nearly 1,200 m² to create attractive routes. Climbing courses and private lessons are offered for climbers of all ages. In addition to these two mega-climbing halls, JUFA Hotels Sport Resorts and JUFA Hotels feature boulder walls in various sizes and degrees of difficulty. Do you want to exceed yourself, together with others and develop your potential? JUFA Hotels offer you a sophisticated concept with multiple programmes. Would you like to experience an unforgettable and active time on top routes, but do you still have questions? Our Sport Team will be happy to help you. Im interested in the offer "Climbing" in the .